Ultimately, luxury cars do the same things that family sedans do. They get the driver from one place to another. So why the premium prices? Quality and style. 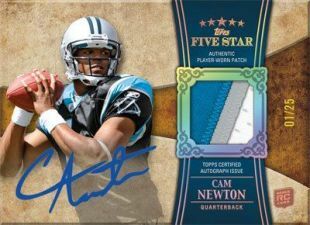 The same can be said for 2011 Topps Five Star Football, the high-end of high-end football card products. Each pack reads like a case of some products: four autographs and either a jumbo jersey or patch. Even the base cards have a luxury feel, carrying massive 154-point card stock. Besides the premium nature of the set's build, Topps is also promising a strong checklist that mixes new stars, current veterans and legends. The base rookie cards come in the form of Rookie Autographed Patches. Parallels: Gold (/55), Rainbow (/25). The rookie card checklist will have up to 35 different players. 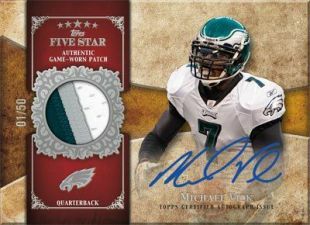 Five Star Signature Patch Cards include up to 20 veterans and legends. Parallels: Gold (/40), Rainbow (/25). More rookie autographs are featured in Five Star Futures Autographs. Five Star Futures Quotable Autographs (/25) and Five Star Quotable Signature Cards (/10)add inscriptions to regular autographs. Five Star Signature Cards have up to 25 veteran and retired signers. Parallels: Gold (/25), Rainbow (/15). Super Bowl MVP Autographs (/50) spotlight the biggest performances from the big game. Five Star Cut Signature Cards (/1). Five Star Signature Book Cards have a checklist of up to 30 cards. Parallels: Gold (/10), Rainbow (/1). Five Star Futures Autographed Triple Relic Book Cards. Parallels: Gold (/15), Rainbow (/1). Five Star Futures Autographed Quad Relic Book Cards. Parallels: Gold (/15), Rainbow (/1). Five Star Futures Dual Autograph Patch Book Card (up to 30 cards, /15). Five Star Futures Dual Autograph Laundry Tag Book Card (up to 30 cards, /10). Five Star Futures Quad-Ograph Book Card (up to ten cards, /10). Five Star Futures Six Signatures Book Card (up to five cards, /5). Five Star Futures Eight Signatures Book Card (up to three cards, /5). Five Star Futures Dual Autograph Shield Book Card (up to 50 cards, /1). Five Star Futures Dual Autograph Card (up to 45 cards, /20). Five Star Signatures Combo Card (up to 50 cards, /10). Jumbo Jersey Relic Cards have a checklist of up to 50 rookies, veterans and retired players. Parallels: Jumbo Patch (/1), Letter Patch (/1). Patch Relics (up to 50 cards, /30). Dual Patch Relics (up to 30 cards, /15). Triple Patch Relics (up to 20 cards, /10). Quad Patch Relics (up to 15 cards, /10). Octo Patch Relics (up to 10 cards, /5). Random redemptions will be inserted for autographed rookie jerseys. These are bonus hits and will not be counted against the regular product configuration. 2011 TOPPS FIVE STAR JAKE LOCKER RC QUOTABLE AUTO "ITS A LOCK" 05 25! !